Alvin Avenue Elementary School second-graders Ana and Brian enjoy drawing in teacher Kristina Velasquez’s class. Alvin Avenue Elementary School second-graders Gustavo (left) and Luis. 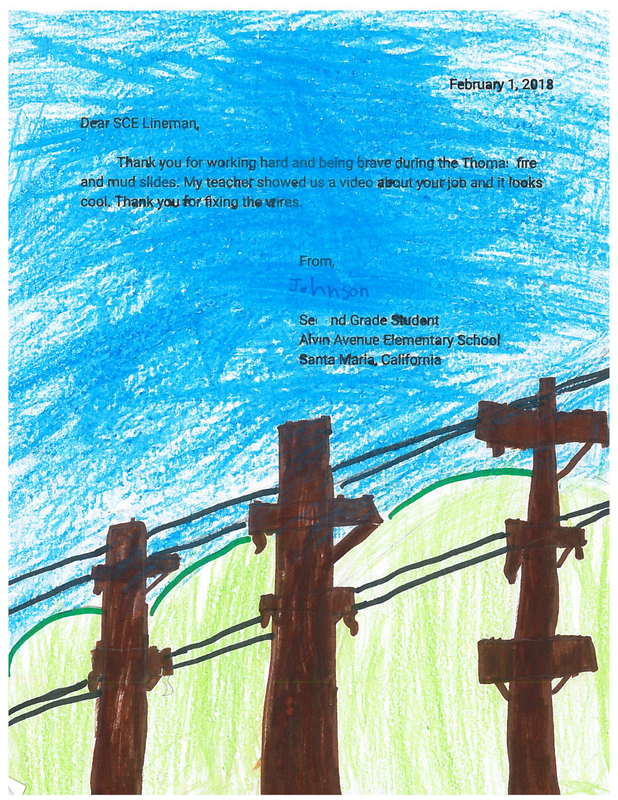 Second-grader Johnson's drawing to thank the SCE linemen who helped restore power during the Thomas Fire. 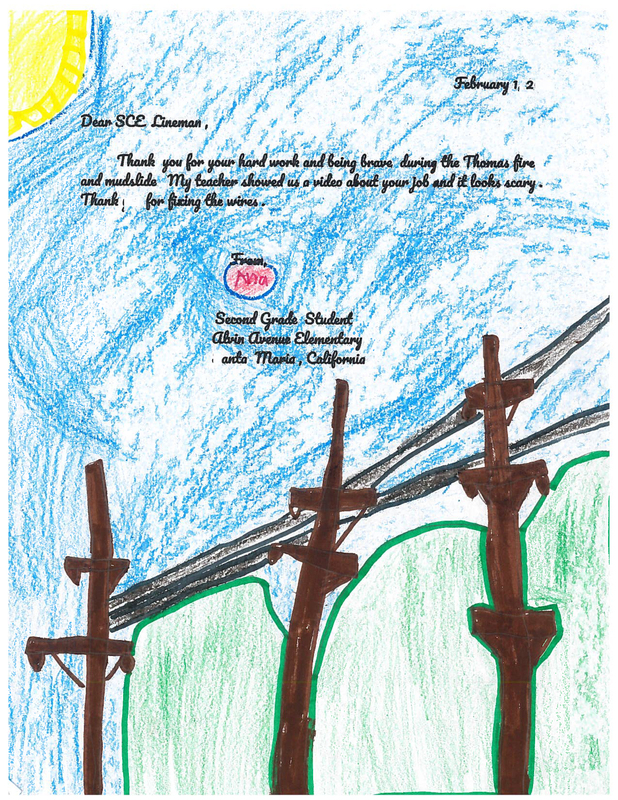 Second-grader Avia's drawing to thank the SCE linemen who helped restore power during the Thomas Fire. Second-grader Joseph's drawing to thank the SCE linemen who helped restore power during the Thomas Fire. 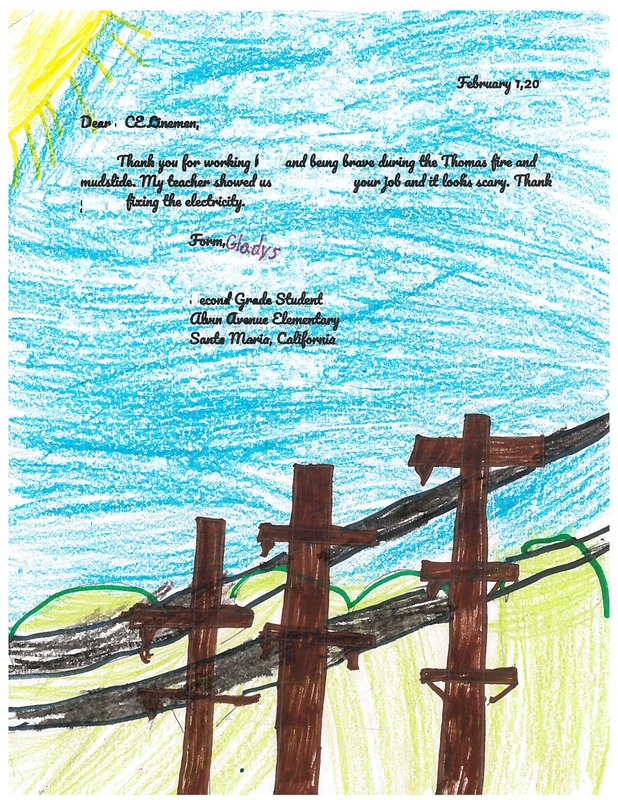 Second-grader Gladys' drawing to thank the SCE linemen who helped restore power during the Thomas Fire. The second-graders at Alvin Avenue Elementary in Santa Maria drew pictures and signed thank you letters as part of a national kindness challenge. “Awesome — that’s so cool! 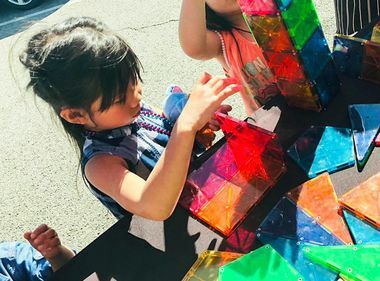 I want to try that!” exclaimed the second-graders in Kristina Velasquez’s class at Alvin Avenue Elementary School in Santa Maria, California. The 25 students had gathered around a classroom monitor to look at YouTube videos of linemen climbing poles and riding in bucket trucks as they worked to restore power. These are the heroes the kids chose to thank for a recent national Great Kindness Challenge. Using crayons and markers to draw their pictures, each of the kids signed and mailed their drawings to Southern California Edison. They wanted to thank the linemen who had helped restore power to affected residents during the recent Thomas Fire in Santa Barbara County. “Thank you for working hard and being brave during the Thomas Fire and mudslides. My teacher showed us a video about your job and it looks cool. 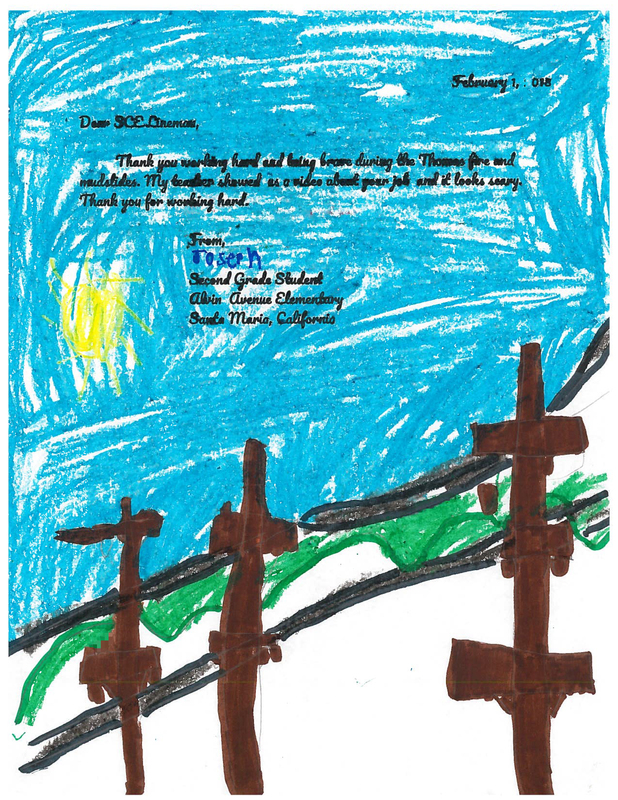 Thank you for fixing the wires,” wrote second-grader Joseph. 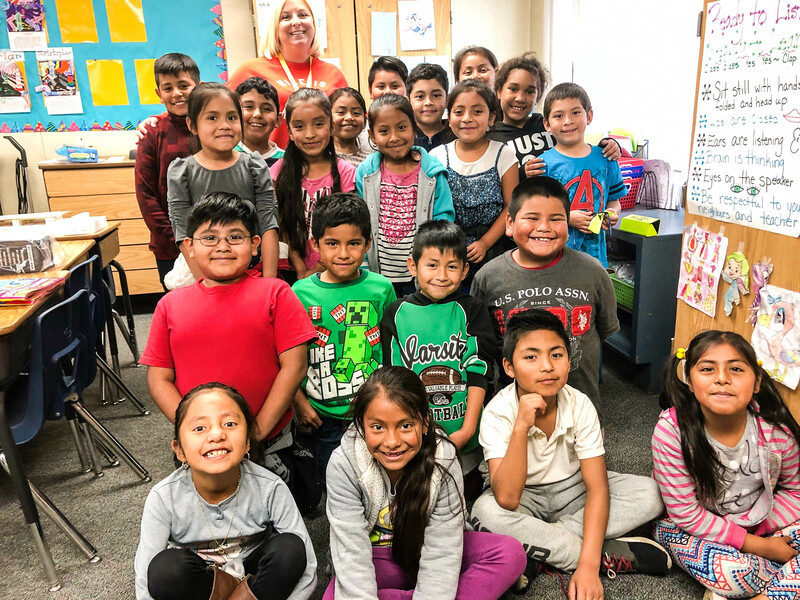 Teacher Kristin Velasquez’s second grade class at Alvin Avenue Elementary School. This is the first year Alvin Avenue Elementary took part in the national kindness challenge. Each of the classes chose various first responders to thank, including the local police and fire departments. The classes spent a day working on their various letters, all part of the school’s four pillars of being safe, responsible, respectful and kind. Velasquez, the wife of a lineman, saw some photos of SCE linemen working the Thomas Fire on her social media feed and brought up the idea to honor these heroes to her students. 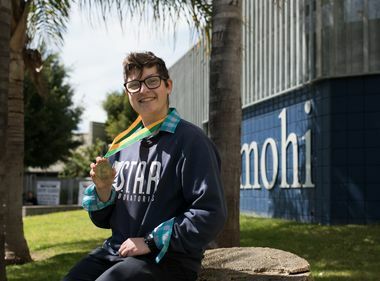 Once she showed her students the YouTube videos, they were sold. 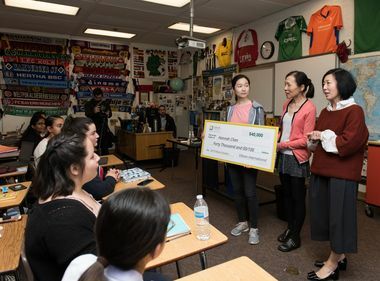 “My students got really excited, they thought the job was really cool,” she said, noting that they also talked about the long hours linemen often spend away from their families and the important work they do helping to restore power. They also discussed the importance of being safe around electricity, especially around downed power lines which they should never approach and that they should call 911 about immediately. The recent Thomas Fire hit close to home for the families and teachers at Alvin Avenue Elementary, many of whom live near the affected areas in Santa Barbara County. The school was shut down for a day because of the smoke and fire and for two days afterward, the kids were not allowed to play outside. SCE lineman Robert Sandoval, 49, from the Ventura Service Center, spent 18 days helping to restore power during the Thomas Fire. As a resident of Camarillo, he knows families who were evacuated and some who even lost homes. “This is our home, our area. We understand what they are going through,” he said. He is humbled by the Alvin Avenue second-graders’ thank you letters and drawings. The kindness challenge was also a time to teach students the importance of kindness toward others, especially in times of crisis. 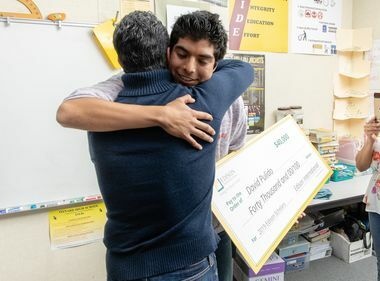 For Velasquez’s students, the challenge also resulted in a piqued interest in a career as a lineman. “There was a lot of excitement that they would like to do that job one day,” said McDaniel. For more information on lineman careers: edison.com/careers.